Realistic with it's concrete appearance, this garden stone can be placed either in a garden or, because it is not thick, can be hung on a wall to express your very sentiments after losing a pet. 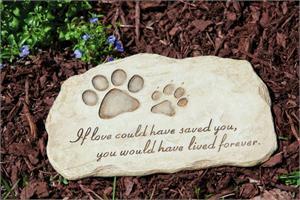 Suitable for either a dog or a cat as a pawprint of each appears in the upper corner of this wonderful piece. Etched just below the pawprints are the words: "If love could have saved you, you would have lived forever". No truer words have been spoken.